Layovers can be mind-numbing and irritating all at once. And God forbid if your airport does not have clean restrooms, reclining chairs, decent wi-fi or that worst crime against travellers: a half-decent place to eat and drink. For decades, Mumbai's airports were guilty of all of the above. travellers went out of their way, literally, to avoid a layover here. The owners of the new Chhatrapati Shivaji International Airport (CSIA) have taken notice and seem to have done an admirable job turning things around. A typical day at CSIA sees close to 700 flights. ThatRs s tens of thousands of potential customers passing through every 24 hours. When GVK won the CSIA modernisation contract in 2006, one of its priorities was to fashion this once-drab airport into a gourmandRs s delight. The airportRs s 21,000 sq mt area now includes not just high-end shopping, but also several worthy options to grab a few drinks or a light meal. In fact, if it werenRs t for all the aircraft flying around, CSIAR's new pubs and cafes could have become the cityRs s go to destinations for a good night out. And thatRs s where we come in. 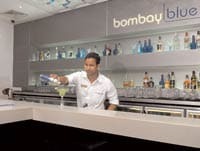 Because if you find yourself with plenty of time before your next flight and are eager for a neat whisky, a fancy cocktail, or even a simple, tall glass of beer, donRs t worry about making a choice. We spent a day checking out CSIARs s new eateries and put together a list of the ones you may want to step into. The name gives away its ownership, as does the cricket livery on the walls. RCB has a blanket of exclusivity around it and its bold red decor takes the attention off its rather narrow interiors. 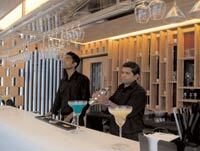 The staff is well-trained and the cocktails are definitely smoother than whatRs s on offer in competitor outlets. The daiquiris here are a winner as is the gin and tonic. Even the martini has a classic smoothness to it. The bar manRs s special - depending on who is mixing drinks when you visit - is a welcome, surprise touch. The name is an obvious choice since the restaurant serves food round the clock. Large glass partitions and skylights help light up the woody interiors. Despite its limited size, thereRs s a decent range of snacks on offer. The crisp nachos come with a thick layer of cheese and a well-balanced salsa. The delicious herbed chicken kebabs are just the right size and perfect for a quick bite. While the food is a big plus, itRs s actually 24/7Rs s bar that shines brightest. It runs virtually the entire length of the lounge. Fruit-based cocktails and mocktails are its strong points. The kiwi martini is refreshing as is the invigorating guava-based mocktail. This lounge is by far the largest at the terminal. It even dwarfs some airline lounges. 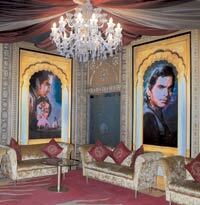 The dÃ©cor is very Bollywood - loud and flashy with red and gold on the walls and velvet upholstery to match. Life-size posters adorn the walls. A television screen airs re-runs of various IIFA award ceremonies. ThereRs s even a crude map of the world that marks cities that have hosted these events. The menu here is exhaustive with three- and four-course meals on offer. The bar serves decent beverages and the service is very professional. Try their delicious green apple martini or the berry-based sparkling cocktail. Bombay Blue has been designed for the international flyer. That translates into everything from the decor to what time the place opens. The ceiling is impressive with sky blue light bouncing off it and illuminating the pristine white bar. It opens only after 8pm, when international flights start coming in. The music is lively but never loud so you can enjoy your drink without worrying about missing your boarding call. The pasta is cooked at a live station where you can see the dish coming to life. Enjoy the barRs s whisky sour and gin rickey while you wait for your food.